Democracy and media freedom are joined at the hip, right? Everybody knows you can’t have one without the other. But has anyone set out to prove it? Their paper aims to fill this gap in research through broad empirical analysis and country case studies. Through rigorous statistical and qualitative analysis of two annual indexes by Freedom House–Freedom in the World and Freedom of the Press–the authors were able to track trends over time in 156 individual countries and to graph the trends “in a way that has hitherto not been easily possible,” the report states. 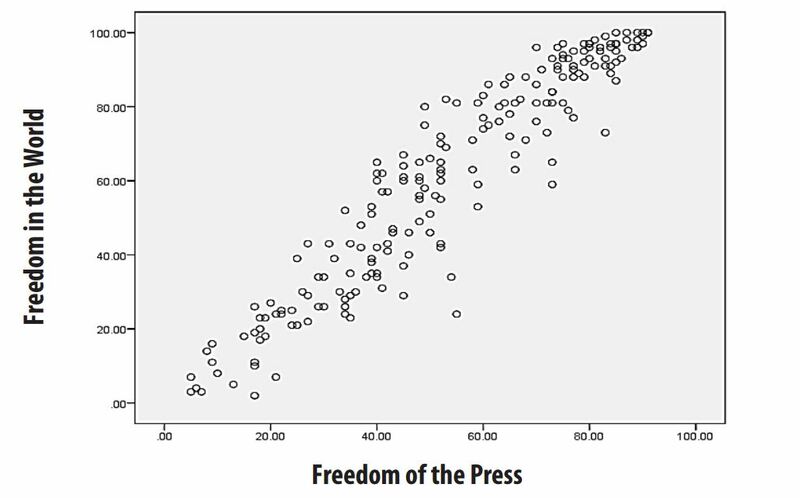 This graph shows this same relationship between Freedom in the World and Freedom of the Press for calendar year, 2012 (index edition 2013). Because the measures in this year are based on a 100-point scale, the data are shown in a scatterplot. Each dot represents a country or countries based on the score each receives on each of the two indexes. See Appendix B for country names. The Spearman’s rho for this analysis is .95. (The Kendall’s tau b is .81, reflecting the correction for ties in this measure; the Pearson’s r is .95). So even with the increased variability of the 100-point scale, the relationship between freedom and press freedom is very strong.